Fredericksburg, Texas Upholds German Traditions. German-American Day (October 10), The White House. German-American Historic Sites and Museums, IUPUI. German Immigration, Library of Congress. German Immigration Webquest, Hazelwood School District, MO. Germany Discovers America: 1800-1918,University of Pittsburgh. Milwaukee Turnerbund: K-12 TLC Guide. Separation of Church and State: K-12 TLC Guide. Nazi Germany: K-12 TLC Guide. World War II: K-12 TLC Guide. A New Surge of Growth. Ellis Island: K-12 TLC Guide. German Immigration to Specific States: K-12 TLC Guides. 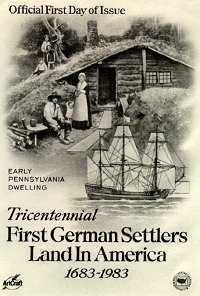 10/06/1683: First German Immigrants to the U.S.: K-12 TLC Guide. Journal of Social History, Find Articles. The American Immigration Law Foundation. Making the Modern World, The Science Museum. Notes Regarding History of V-2 Operations at White Sands. Ethnic Politics: German-Americans as Voters and Office-Seekers. Inequality: Incomes, Occupations, Social Structure. Integration: The Ideals of Cultural Pluralism. Likes Attract: German Clubs and the Display of "Germanness". Seven Million Germans were once "Foreigners". Moravian Music: K-12 TLC Guide. U.S. Diplomatic Mission to Germany. Arendt, Hannah (Johanna): K-12 TLC Guide. Astor, John Jacob: K-12 TLC Guide. Atkinson, Rick: K-12 TLC Guide. Auerbach, Erich: K-12 TLC Guide. Lomb, Henry: K-12 TLC Guide. Bethe, Hans: K-12 TLC Guide. Bierstadt, Albert: K-12 TLC Guide. Brauer, Alfred Theodore: K-12 TLC Guide. Bukowski, Charles: K-12 TLC Guide. Dietrich, Marlene: K-12 TLC Guide. Einstein, Albert: K-12 TLC Guide. Eisenstaedt, Alfred: K-12 TLC Guide. Friedrichs, Kurt Otto: K-12 TLC Guide. Gropius, Walter: K-12 TLC Guide. Hellinger, Ernst David: K-12 TLC Guide. American Composers: K-12 TLC Guide. Kissinger, Henry Alfred: K-12 TLC Guide. Leutze, Emanuel: K-12 TLC Guide. Levitin, Sonia: K-12 TLC Guide. Bausch, John Jacob: K-12 TLC Guide. The Cinema of Ernst Lubitsch. Inventors and Inventions: K-12 TLC Guide. National Inventors Hall of Fame. Architecture and Design: K-12 TLC Guide. The Fundaci� Mies van der Rohe. Minuit, Peter: K-12 TLC Guide. Nast, Thomas: K-12 TLC Guide. Nichols, Mike: K-12 TLC Guide. Noether, Emmy Amalie: K-12 TLC Guide. Art History: K-12 TLC Guide. Potts, John: K-12 TLC Guide. Rademacher, Hans: K-12 TLC Guide. Reichenbach, Hans: K-12 TLC Guide. Remarque, Erich Maria: K-12 TLC Guide. Rey, H.A. : K-12 TLC Guide. Rey, Margaret: K-12 TLC Guide. Music Theory and Musical Instruments: K-12 TLC Guide. von Steuben, Friedrich Wilhelm Augustin: K-12 TLC Guide. Strauss, Levi: K-12 TLC Guide. Sutro, Adolph: K-12 TLC Guide. Tubach, Fritz: K-12 TLC Guide. Musicians and Performing Artists: K-12 TLC Guide. The Bruno Walter Memorial Foundation. Weill, Kurt: K-12 TLC Guide. Wilczynski, Ernest Julius: K-12 TLC Guide. Zorn, Max: K-12 TLC Guide.